The most influential post that Dan Levy, Facebook’s Director of Small Business, ever saw was an ad for a house in Palo Alto. He said clicking on that ad led him to actually purchase the house pictured. 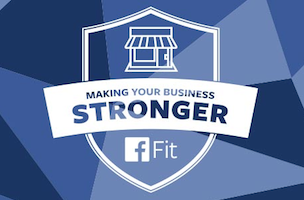 Levy spoke with roughly 350 small business owners, employees and entrepreneurs Tuesday morning at the final Facebook Fit event at the company’s headquarters in Menlo Park, Calif. This was the finale of the five-city tour, where Facebook spoke with 4,000 business owners across the country about how to find success via the social network. As reach becomes harder to come by, small business owners on hand to speak said that the most important thing was creating engaging content and utilizing advertising to get that content in front of those who would be most likely to convert or sign up. Levy discussed how many small businesses are seeing great return on investment from smart, targeted Facebook ads. He pointed out that Morgan Miller Plumbing, near Kansas City, Mo., has seen a 39x return on ad spend. Kay’s Designer Consignment in Florida has experienced a 30 percent lift in sales from Facebook advertising in the past 9 months. We really want Facebook to be as easy to use (for business) as using Facebook as a person. You can just snap a picture and be on your way, getting back to your business. Facebook also invited a few prominent small business owners to talk with those in attendance. Andrew Chau (Boba Guys), Julie Shenkman (Sam’s Chowder House), Amy Norman (Little Passports) and Nadia Aly (Scuba Diver Life) shared their experiences both marketing and advertising on Facebook, and how they were able to grow their business through the site. I have seen a decrease in the organic reach and I’m completely OK with it. The reason for that is Facebook is changing its algorithms to make sure that people see the material that they want to see. If people aren’t clicking on my organic posts or sharing them, it’s because it’s not a great piece of content for them. As a Facebook user, I see things come through my feed that I really don’t want to see. If peoples’ feed is flooded with content that they don’t want to see, they’re not going to pay attention to the good content. For me, as a business owner, I’m OK with it. When I pay to advertise to get in front of everybody, it’s ROI-positive. One of the main takeaways from the event was to keep content timely, engaging and relevant to your audience. What works for one business may fail for the next. Facebook representatives at the event suggested using A/B testing and trying out different post types to figure out what your audience wants to see most — then put some advertising dollars behind that. Readers: If you manage a small business, what is your content management strategy?